The state of Hawaii is composed of many islands, seven of which are inhabited. I have to admit that, until I got to visit the state this past January, I would not have been able to name those islands–O’ahu, Maui, Hawaii, Kauai, Lanai, Molokoi, and Ni’ihau. Most people know about O’ahu. How many have heard of Ni’ihau? With a population of about 160, it is a well kept secret and deserving of the name, the Forbidden Island. Ni’ihau has been a privately owned island since 1864, when Elizabeth Sinclair bought it from King Kamehameha IV for $10,000 in gold. Her great-great grandsons, Bruce and David Robinson, own the 70 square mile island now, and they have kept the island isolated and pristine. The families that live on the island today are descendants of the original families that lived there in the 1800s. The people have their own dialect of the Hawaiian language. They live a lot like their forebears. This is one place where not much has changed. The people of Ni’ihau are well known for the beautiful shell leis they create. Families have unique patterns that they use in their jewelry. Artists use the tiny shells that wash up on the beach, including the highly sought after Kahelelani shell. The sale of these leis, bracelets, and earrings is a major source of income for the Ni’ihau people. Prices are determined by the rarity and quality of the shells as well as the skill of the artisan. When I was on Maui, I bought a beautiful bracelet that came with its own certificate of authenticity. I was told that, in the past, there were “copy-cats” who undersold the true artists. So the certificate is important. 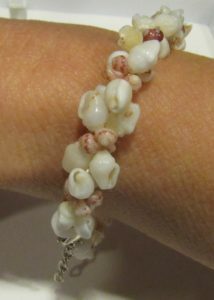 Be wary of shell jewelry that seems poorly made or is extremely inexpensive. My shell bracelet from Ni’ihau. If you are planning to go to Hawaii, I would encourage you to learn about the history of Hawaii. It’s loaded with interesting characters like Captain Cook (not Hook), Queen Emma (wife of King Kamehameha IV), and even Elizabeth Sinclair (an amazing pioneer from Scotland, who ended up owning an island!) I loved learning about all the King Kamehamehas (there were five of them) and their wives. 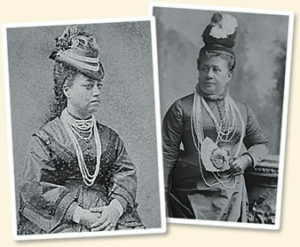 Two royal women, Queen Kapiolani and Princess Lili’uokalani, can be credited with popularizing shell jewelry. They traveled to England for Queen Victoria’s Golden Jubilee in 1887, where they wore their long leis and made quite the splash! “Huh? What’s a gorno?” Well, truth is, he wasn’t completely sure. And the fact is, it’s not a gorno. 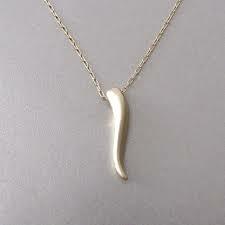 It’s a corno or a cornicello. Turns out this is the Italian word for “horn” or “little horn.” It apparently protects the wearer from the evil eye. The evil eye is a look, given to inflict harm or bad luck. There is widespread belief in the power of the evil eye, but, supposedly, it started in ancient Greece. Now, the “evil eye” I’d seen before, a few months back when working with a different customer. It’s kind of confusing, because some people wear an amulet of an eye, as protection from evil. They call the amulet the evil eye. So I guess an “evil eye” can be either bad luck OR good luck. I think every culture has their own version of a good luck charm. 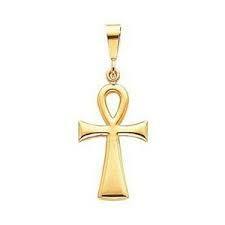 The “ankh”(pronounced awnk) is actually the Egyptian symbol for life. As the key of life, it represents zest and energy, and some people wear it as a protection from demons. It resembles a Christian cross, but has a loop at the top. I guess we all can use a little good luck from time to time. Can it hurt to wear a good luck charm? It’s just nice to know there are so many options. Crystal vs. Glass–What’s the difference? 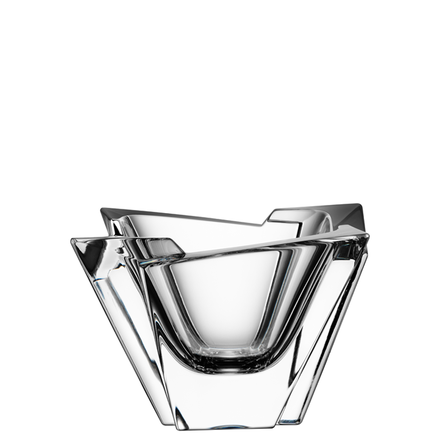 At Dearborn Jewelers we sell both crystal and glass, in the form of vases, pitchers, glasses, and bowls. We get our crystal from Orrefors and our glass from Simon Pearce. They both make stunning pieces, so what’s really the difference between crystal and glass? CRYSTAL is the name traditionally used to describe glass that contains lead. Lead oxide makes the glass more clear and more refractive than non-leaded glass. It also makes the finished product smoother, so that it can be more precisely cut. Lead helps lower the working temperature of glass, extending the time that glassmasters can work with the molten crystal and making it possible to create more intricate designs. At the same time, lead-crystal is more fragile and prone to scratching than glass, and, of course, there are health concerns associated with lead. These days many manufacturers, including Orrefors, make lead-free crystal using zinc oxide, potassium oxide, or barium oxide instead of lead. There were too many concerns over drinking or eating out of lead crystal containers. Since 2000, it has been illegal in Europe to make wine glasses or containers with lead crystal. The non-leaded crystal is a little different, being harder and also lighter in weight. But it is a healthy substitute for lead crystal. GLASS has a few different recipes, but the most common and least expensive glass is made from limestone, soda ash, and silica. 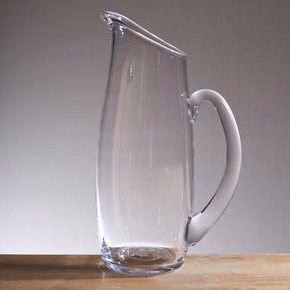 Glass has always been safe for food storage or serving. People have been manufacturing and using it since 3000 BC. Nature also makes glass. When lightening strikes sand, the heat can fuse the sand, making fulgarites. When the heat from a volcanic eruption fuses sand and rock, obsidian is the product. So crystal and glass are really quite different. To get a side-by-side view of our crystal and glass pieces, come into our store. We would be happy to show you the difference. I had a very special ring designed for my fiance. Teri was very helpful and went above and beyond to make sure that the ring was exactly what I wanted. I Highly recommended them! Great Family Business!!!! Me and the wife love this place. I cannot say enough good things about Dearborn Jewelers of Plymouth. The staff is extremely knowledgable about all their products and is not pushy at all. I frequently go here to look at engagement rings and they are always more than willing to let you try them on and explain the different styles/cuts, etc. They are amazing at custom jewelry as well. If you have a bracelet that's too big, they can take the extra gems/stones/jewels and turn it into a necklace or earrings. My sister had my grandma's tennis bracelet made smaller and turned into a pendant necklace and set of stud earrings. My boyfriend had a necklace made for me from a bracelet about a year ago. The chain he picked was a bit short for my liking, so I didn't wear the necklace as much as I would like. However, I went to get a longer chain yesterday and they were so kind they exchanged the previously purchased necklace for a longer one at no charge. Their customer service is absolutely outstanding. Again, I'd HIGHLY recommend Dearborn Jewelers to anyone in the area looking for jewelry. I recently had a bracket on my watch repaired. Not only was service fast and inexpensive ($10) but they went above and beyond. I picked up a repaired watch that was sparkling clean. They also made a small repair to the watch (that hadn't bothered me enough to have fixed) and set the date (which I had never understood how to set) all without me even requesting it. I appreciate businesses that do the extra things and provide quality services so I wanted to review Dearborn Jewelers since I am very impressed with how they do business. For our 30th wedding anniversary, I had a custom ring made by the talented team at Dearborn Jewelers. It turned out beautifully. I highly recommend Dearborn Jewelers if you are looking for a trustworthy, highly skilled, creative, fair and dependable jeweler. Top Notch!